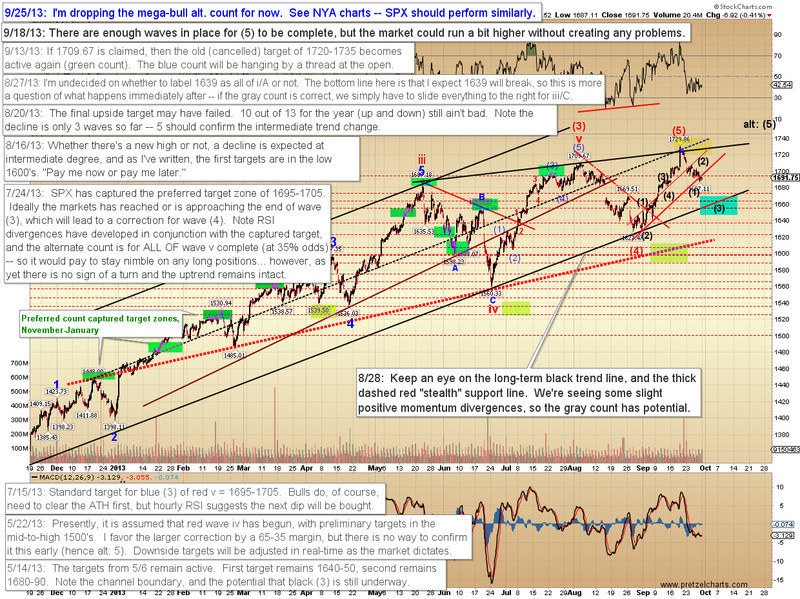 Pretzel Logic's Market Charts and Analysis: Is Social Mood Turning? 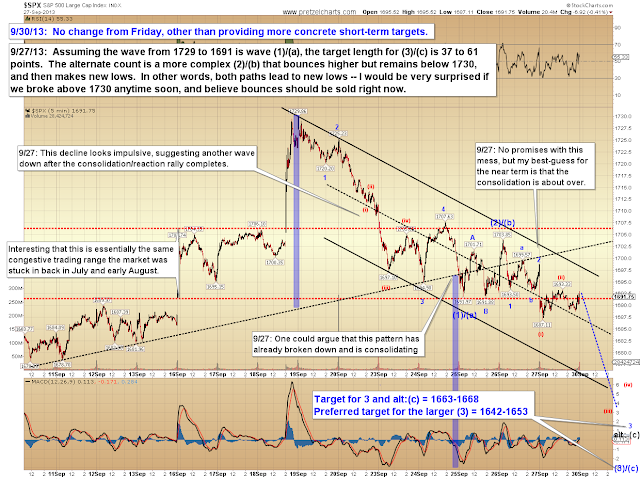 In Friday's updated, I noted that the charts suggested further downside was imminent. Friday's market indeed closed in the red, and as of Sunday evening anyway, futures are implying a 10+ point gap down for the S&P 500 (SPX) cash open on Monday. The big news item right now is the looming threat of government shutdown. I'm not going to comment on the sides in this debate, but I do find the reaction of the public extremely interesting: A recent NY Times poll shows that 8 in 10 Americans disapprove of the threat of government shutdown, from either Congress or the President. I have no intention of debating who's right or wrong here, however, I do have some thoughts I'd like to share about a larger trend in American philosophy. 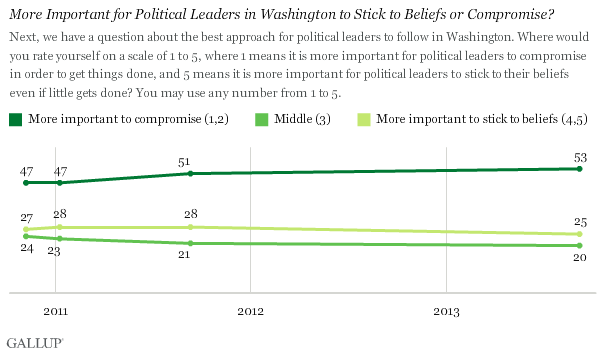 A different, yet conceptually related, Gallup poll ostensibly shows that 53% of Americans think that compromise in Washington is more important than sticking to principle. In my mind, that poll result is at least partially suspect, though, since the way the question was phrased almost certainly impacted the result. The question is reprinted below: notice how "compromise" was linked to "in order to get things done," whereas "stick to beliefs" was linked to "even if little gets done." The poll would probably have turned out at least slightly differently if they had linked "stick to beliefs" with "in order to get things done" and vice-versa. But being the crazy radical that I am, I'm going to challenge the entire question. I believe two presupposition behind the above question are fallacy. First: when did compromise for its own sake become any kind of meaningful ideal? Pardon my French, but what a bunch of balderdash. Compromise isn't an ideal -- by definition, it's what happens when you bend your ideals. Of course, compromise can be a good thing, as it often is in a marriage -- but it can also be a very bad and harmful thing, depending on what you're compromising, and with whom you're compromising. If my neighbor suggests that he wants to burn my house down in order to improve his view of the ocean, I'm not going to compromise simply to live up to the ideal of compromise. And I'm not going to compromise for the sake of "getting things done." I'm going to stand on principle and try to subvert his intentions, even if he accuses me of being "an argumentative obstacle to progress." Which brings us to the second fallacy: Even if compromise were an ideal, compromise simply for the sake of "getting things done" is not necessarily positive, because "getting things done" is not unilaterally synonymous with progress. I can drive my car off a cliff, or smash all my toes with a ball-peen hammer, and I'm "getting things done." Further, my idea of progress may not agree with yours. Progress, whether in Washington or elsewhere, is really nothing more than someone's opinion. And since opinions will always differ, we simply cannot "all just get along" via the vague ideal of compromise as the solution. Nor should we want to. Do any of us really want to live in a country where nobody stands on principle, and nobody truly fights for or against anything? I don't think the majority really want that; I think they simply haven't thought it through. In my opinion, ideals which have real value are those which are always the right course of action regardless of circumstance: ideals such as honesty, integrity, kindness, etc. Those are things we can and should strive toward at all times. But compromise simply cannot be an ideal that stands unto itself, because it's not always the right thing to do. The fact is, the seemingly-painless solutions we sometimes reach with "win-win compromises" are often only painless over the short run. Over the long run, bad ideas eventually have lasting consequences if put into action. We face a possible government shutdown, and most Americans feel a shutdown would hurt them -- so compromise seems to offer some vague solution as a way to subvert that pain. We may not really know what compromise looks like in this situation, but we know (at least over the short run) that it probably won't be as painful as a shutdown. And thus we get 80% disapproval. I don't personally know whether a compromise here would be good or bad in the long run -- I don't pretend to have a solution, and that's not really my point. My point is simply that I don't believe we should automatically assume that compromise in general is necessarily always better than the alternative. From a chartist perspective, it's interesting that we had the threat of the fiscal cliff near the second wave bottom, and now we have the threat of government shutdown near the (assumed) fifth wave peak. One of the concepts behind Elliott Wave Theory is that social mood goes through predictable cycles (human nature doesn't change) -- and those cycles leave patterns on the charts indicating the psychology of the masses is reversing from positive to negative (or vice-versa) at major peaks and troughs. 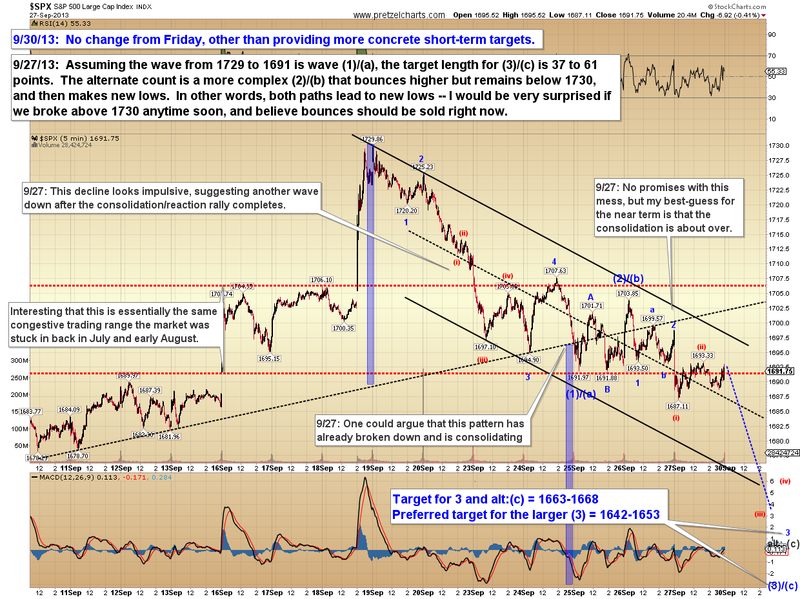 Near-term, it appears the market is about to enter a smaller-degree nested third wave. This suggests selling pressure should continue for the foreseeable near-term future, as the market will need to unravel several low-degree fourth and fifth waves before finding a meaningful bottom. In conclusion, the projections from last week are tracking well so far, and there's presently no sign that any type of bottom is imminent. 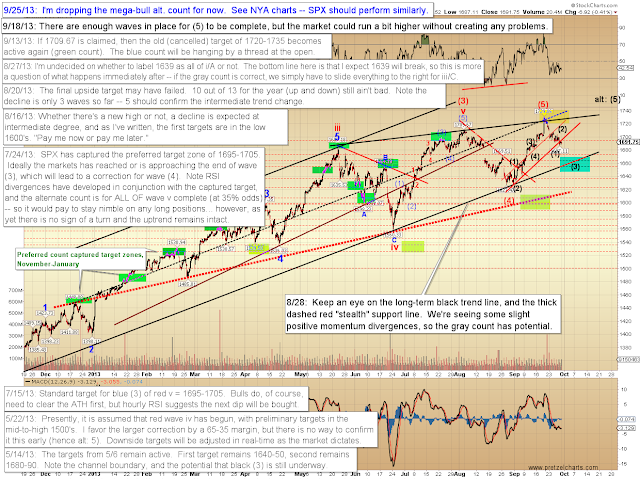 As noted previously, I continue to suspect we've seen a turn in the higher degree wave structure, and that the market is in for an intermediate decline. Trade safe. Reprinted by permission; Copyright 2013, Minyanville Media Inc.